That would be an awesome project. Does anyone know if the earlier style G4 taillight assemblies have the same extra mounting boss? All of the G4 lights have them... in '04 they added the clear lense over the "unused" housing. I have strobes in mine ('03 w/ the red lense). I'm going out tomorrow to find a couple of light sockets, and may stop at the local wrecking yard to find an extra set of lights. If I can get to this in the next couple of days, I'll do a write-up w/ a bunch of pics! 1. What is the multi-function switch? The headlight switch? The turn signal switch in the wheel? 2. Does anyone have a pic of the wiring harness for an '06, so I can see the color codes of the wiring? Multi-funtion switch is the turn signal stick. 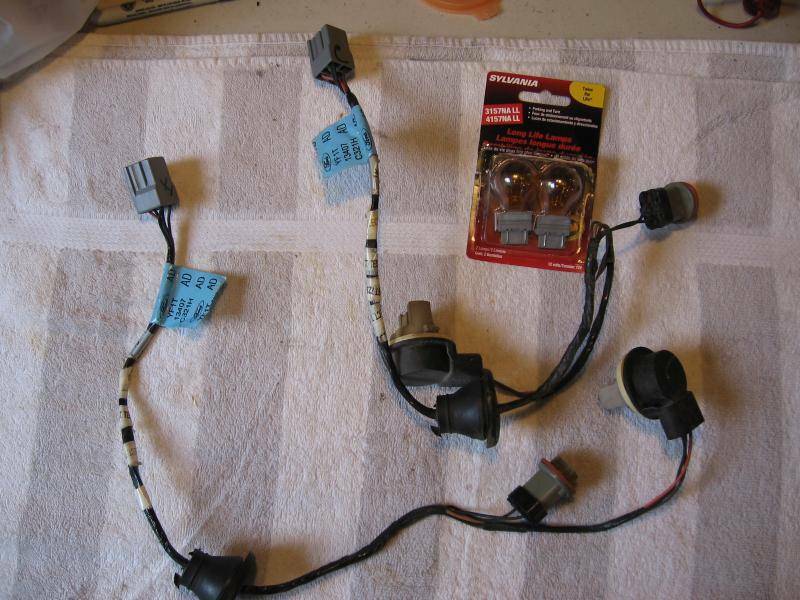 As for the taillight wiring, you can do it by feel with a volt/ohm-meter. could this have possibly been for a police taurus to put the strbes there? No. Ford originally planned to put an amber signal there, but they axed the plan to save money. Funny thing is, the '04 Sable gained the functioning amber turn signal. Definitely an original mod. Keep us up to date here. YAHOOO!! I got the bulbs installed into the taillights yesterday! Now, IÃ¢â‚¬â„¢ll bet there are probably 50 ways to leave your lovÃ¢â‚¬Â¦Ã¢â‚¬Â¦Ã¢â‚¬Â¦..ahhh, never mind. Any how, IÃ¢â‚¬â„¢m sure there are MANY different ways to do this, so this is how I did it. My original plan was to use 7440 amber bulbs because theyÃ¢â‚¬â„¢re smaller, but I couldnÃ¢â‚¬â„¢t find any sockets that seemed to clear the body panel behind the taillight, so I decided to go with a socket that had a 90 degree plug, similar to the original sockets. I had originally gone to AutoZone and bought some replacement sockets and 4157 amber bulbs (the only sockets they had were for a GM), but after getting the sockets home, I decided I didnÃ¢â‚¬â„¢t like them. I took a trip to the local wrecking yard, and got the wiring harness sections that go into the taillights for an Ã¢â‚¬â„¢02 Bull. I figured that way, all the parts look correct, as theyÃ¢â‚¬â„¢re all Ford parts. The way I plan to wire this up is to just use the brighter filament of the dual-filament bulb, so I removed the wiring for the running light portion of the sockets. Total cost for wiring and bulbs, $20.